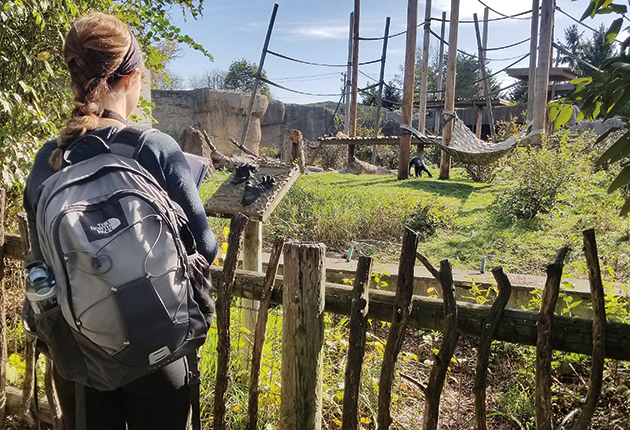 In the Evolution, Ecology and Organismal Biology (EEOB) Undergraduate Research Laboratory in Behavioral Ecology (UResearch), there’s no room for monkeying around, except when it comes to the bonobos at the Columbus Zoo. Throughout the 2017-2018 school year, students in the UResearch Lab collected and analyzed data on the zoo’s population of bonobos, an endangered species of primate closely related to chimpanzees. Students Sophie Aller and Madison Zimmerly focused on dominance behaviors, and Jamie Champlin and Chelsea Mascuch studied grooming habits. Aller and Zimmerly's work challenges previous research that states female bonobos are more dominant than male bonobos. They were also trying to confirm if these dominance behaviors are consistent across both wild and captive populations. Similarly, Champlin and Mascuch were researching the effects of social grooming on social group dynamics in captive bonobos. Because bonobos are understudied as a species, Champlin hopes their research can help create a better understanding of bonobo societies and group dynamics. The UResearch Lab would not exist without EEOB research scientist Zeynep Benderlioglu, who built the lab and its curriculum on the idea that undergraduate students should have access to intensive research opportunities. Benderlioglu began by designing courses that emphasized research-design, hypotheses, appropriate data collection, statistical analyses and grant writing. She added peer-mentoring and outreach components and launched the new lab during the 2013-2014 academic year. Over the past four years, students have been involved in myriad projects, including studying aggression in field crickets and the effects of textbook construction. They also have participated in multiple outreach initiatives through Columbus City Schools and the Columbus Metro Parks, engaging more than 4,000 children and families in Franklin County to explore basic science and animal diversity. For Benderlioglu, watching students grow and develop their skills throughout their time in the lab reminds her why the work she’s doing is important. Working in the UResearch Lab has inspired many students to pursue research beyond their undergraduate careers. Champlin, for example, wants to conduct research in the field of ecological restoration. Aller is set on continuing to conduct research beyond the UResearch Lab and is confident that the skills she gained under Benderlioglu’s guidance will help her go far in the field.